U.S. Rep. Steve Knight, R-Palmdale, and SCV Historical Society President Alan Pollack testified in a committee hearing on Tuesday in support of Knight’s legislation to create a St. Francis Dam National Memorial and Monument in the Santa Clarita Valley. H.R. 5244, the Saint Francis Dam Disaster National Memorial Act, would create a national memorial at the site of the 1928 St. Francis Dam Disaster in the San Francisquito Canyon, which claimed the lives of 431 people. The memorial would be funded by private donations and would establish a 440 acre national monument encompassing the designated national memorial area that was devastated in the resulting flood. 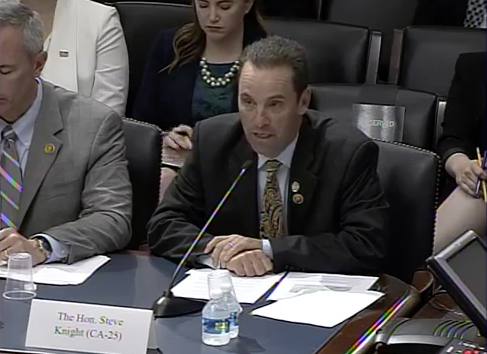 On Tuesday the House Natural Resources Subcommittee on Federal Lands held a hearing to gather information about the bill, in which Rep. Knight explained the need to memorialize the victims of the disaster. Rep. Knight was joined in the committee by Dr. Alan Pollack, president of the Santa Clarita Valley Historical Society, who has advocated for years to create the St. Francis Dam Memorial and presented the legislative idea to Rep. Knight. Dr. Pollack’s testimony detailed the dam’s history, beginning with its flawed design and construction and ending with its abrupt and devastating collapse. He explained that while the disaster generated immediate headlines and legislation, it is not widely known today. He concluded that a national monument is long overdue and necessary to memorialize the victims of the catastrophe. H.R. 5244 now awaits further consideration by the House Natural Resources Committee.